The conditions under which the harvest takes place, from picking to pressing, have an influence on the aromas and composition of the future eaux-de-vie. Indeed, in recent years, several studies have enabled a better understanding of certain important mechanisms that take place during the harvest and explain their direct or indirect effects on the quality of the Cognac. 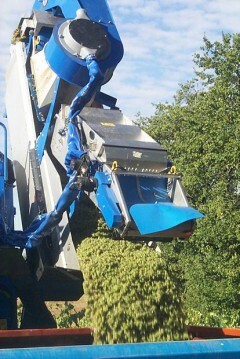 After picking, the harvest must be quickly brought to the cellar and pressed, to limit oxidation of the grapes. To keep up with improved performance by mechanical harvesters, pressing facilities have had to adapt. The use of centrifugal pumps to transfer the harvest is banned. In the Cognac region, winegrowers never sell their harvest to Cognac merchants. More than 5,500 growers produce wines that will be distilled to produce Cognac.